EVERY Living creature in the animal kingdom, aside from insects, have an endocannabinoid system. It is an independent system in the body. The endocannabinoid system is responsible for homeostasis in your body. It is basically receptors and molecules that fit into those receptors that then cause things to happen which are beneficial. They cause us to eat and to sleep and to relax, and also to forget. There are also protective roles of endocannabinoids and we use these cannabinoids all the time in the background without even knowing it. 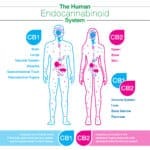 Endocannabinoids and their receptors are throughout your body: in your brain, organs, in your glands, and even your connective tissue. They are not found in your lungs or heart, which makes cannabis a safe choice because it does not affect heart or breathing functions. Your natural cannabinoids protect nerves from being over excited millions of times each day – for instance if something is too bright or too loud, the body is able to downregulate (*or upregulate) those nerves using the endocannabinoid system – these are endogenous cannabinoids. This natural cannabinoid system modulates the activity at the synapses in your brain. It is a very important physiological system that functions to restore balance to the body, helps regulate our mood, and aside from protecting the nervous system those cannabinoids protect against cancer cells too. The endocannabinoid system completes complex actions in our nervous system, our immune system and in our body’s organs. It connects our mind and our body. Our cannabinoids are responsible for helping regulate our mood, your brain’s ability to form new neural connections and pathways, and even influence our creativity. Phytocannabinoids are plant substances that stimulate cannabinoid receptors. Cannabis contains cannabinoids that act as supplements for which our body needs. These cannabinoids mimic the naturally occurring endocannabinoids and work in symbiosis within your body. People who respond well to cannabis may have an endocannabinoid deficiency. Some of the scientifically proven endocannabinoid deficiencies that have been studied include MS, Fibromyalgia, Depression, and Migraine. The discovery of the endocannabinoid system is the most influential discovery in decades when it comes to basic biology. Sidebox note = Discovery: All of the neurotransmitters (like serotonin) are water soluble molecules and the cannabinoids are oils as transmitters. Researchers have identified two cannabinoid receptors most commonly referred to — CB1 (predominantly found in the nervous system and organs) and CB2 (found in the immune system). Many structures and tissues contain both CB1 and CB2 receptors, each associated with a different action. Want to learn more? Come in to the store! Find your closest location. 1198 B N MAIN ST.
© ROOTS RX, . ALL RIGHTS RESERVED.